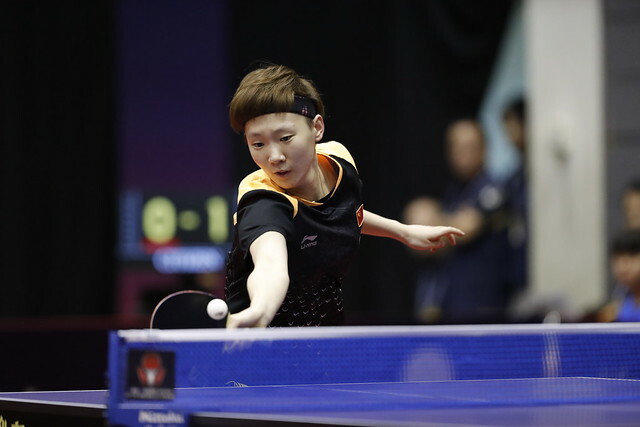 The host nation versus China, honours were shared as the second round of the Men’s Singles event at the Seamaster 2018 ITTF World Tour Lion Japan Open in Kitakyushu came to a close on the late morning of Saturday 9th June. However it was on the all Chinese clash that attention very much focused. Tomokazu Harimoto duly flew the flag for the Land of the Rising Sun; the no.6 seed, he beat Zhou You (11-8, 11-7, 12-10, 11-7), a player who had been required to compete in the two day qualification tournament. A straight games win for Tomokazu Harimoto, it was the same result for Ma Long when facing Maharu Yoshimura (12-10, 11-1, 11-4, 11-4). The win meant that Ma Long maintained his perfect record against Maharu Yoshimura; in world ranking events, they have now met five times in the past two years, on all five occasions the verdict has been in favour of the Chinese star. Conversely, in the match of the round, Zhang Jike beat Chinese National Team colleague, Liang Jingkun by the very narrowest of margin, a titanic seventh game was the order of the day (8-11, 11-9, 2-11, 11-7, 11-3, 2-11, 15-13). Success for Zhang Jike, in the one remaining Men’s Singles second round contest, Lee Sangsu, the no.4 seed, emerged successful but he was severely tested. He overcame Chinese Taipei qualifier, Liao Cheng-Ting but he needed the full seven games to achieve the feat (11-8, 11-8, 6-11, 11-6, 9-11, 11-7, 11-6) and avenge the defeat he had experienced when the two had met on the ITTF World Tour in 2014 in China. In the round of the last eight Germany’s Timo Boll confronts Japan’s Kenta Matsudaira, Zhang Jike opposes Jin Ueda, like Kenta Matsudaira from Japan. In the opposite half of the draw, Lee Sangsu faces Chinese Taipei’s Chuang Chih-Yuan, Tomokazu Harimoto plays Ma Long.